[I’m beside-myself with excitement and joy to bring you a guest post by Andrea from ABCcreativity. Andrea is the coach I most admire and appreciate on the internet today. She seems to constantly create and share a beautiful, vibrating feeling of love and abundance, creativity and spirituality. 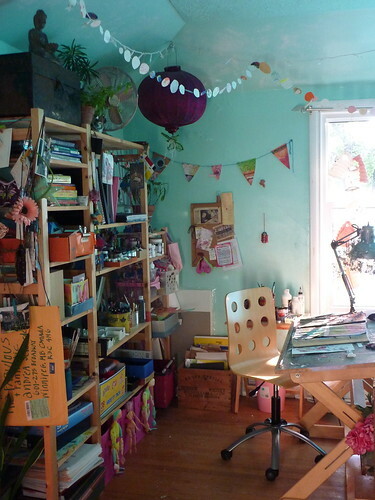 I signed up for Andrea’s Creativity 101 e-course – it is spectacular (+free!) and her honey-voiced, guided meditations have reduced me to lovely, healing tears. “What I love about Inner Wild Therapy is that the posts here flow into that deep space beyond words. Right now, The Case for Constraint is speaking to something deep inside me. For several years as a struggling artist, I saw day jobs as the devil and did everything I could do avoid them. I would not be constrained. I had no idea that the very thing I rebelled so much against, the day job, was the very thing that would move me forward and onward and into fabulous new worlds and experiences i couldn’t even see from my day job-less world. When I got that day job, seven years ago, I swore it was only temporary. But as I settled into the routine of an employed person, my creativity began to soar. Constrained, for sure. My days weren’t free for art anymore. But when it was time for art – I was focused. I was clear. I was more productive as an artist when I had a full time job! Who would have thought? New art supplies. Courses. Retreats. Stability. Routine. Growth. The biggest constraint, the day job, turned into my best tool for creating a life that feels right for me. It was like a little incubator. And as I grew stronger and my creative work great bigger, the incubator got smaller and I shifted into part time work. I am coming up to the part now where it’s time to let the day job go completely. To release the constraint and fly free. And this part is so much harder than I ever would have thought. Every day I am stunned about how much there is to process in letting this part of my life go. This is it. Freedom. No constraints. And I know I’m ready. Or I’m getting ready anyway. I’m planning to leave my job by the end of the year. But in the meantime I am so really fully completely aware of how beneficial the constraint has been. The safety and nurturing of it. The familiarity. And then I get to this part in The Case for Constraint. And that means our creative power can explode like a new universe from a black hole. But really what it’s all coming down to for me is that this can’t be separated. Constraint and freedom are partners. I’ll always have both and how comfortable can I really get with that fact? There are ebbs and flows. There is downtime. There are reasons to contract. Just like there are reasons to expand and create and enjoy. There has to be balance. All I can really do is listen to my life, listen to my heart, do my best to do what feels right and trust what shows up – if it’s constraint or freedom or success or stillness or a big mess or a totally amazing adventure. Image “i know who i am” borrowed by me from Andrea’s Art Exhibit: “let’s all live happily ever after, a celebration of life, possibility and dreams about to come true” which I just discovered is on redbubble – available for sale as Greeting Cards, Matted Prints, Laminated Prints, Mounted Prints, Canvas Prints and Framed Prints. 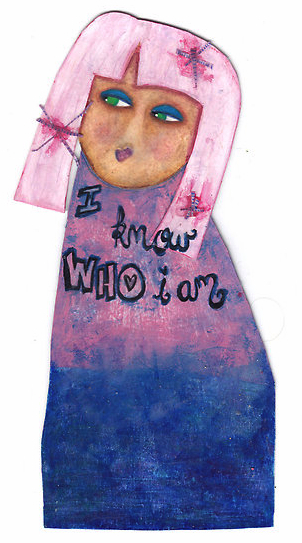 For stories about Andrea’s series of darling & inspiring paper dolls, creativity blog, art journaling videos, online creativity workshops and guided meditations visit ABCcreativity. thanks so much for inviting me to your blog!